The genius of this recipe is in its simplicity! 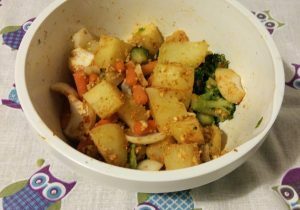 It is one of my favourite ones, because it is delicious, healthy and it represents the perfect side of almost everything! 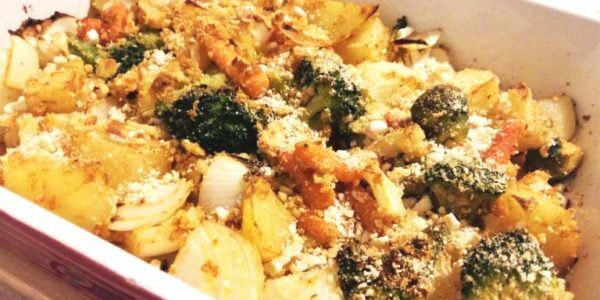 Roasted vegetables are usually one of the most beloved side dish in every occasion, mostly during celebrations and holidays, like Christmas meals! 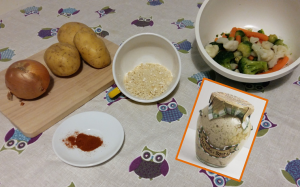 In this version, I’m also going to add to the traditional ingredients; crumble bread, paprika and… garlic patè!! The flavour gets richer and even more tasty, with a dub of spiciness and crunchiness. 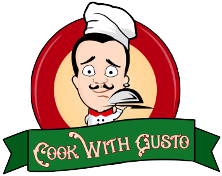 Perfect for meat, roasted beef, fish, cheese and whatever you prefer! Peel the potatoes and boil them for 15 minutes. 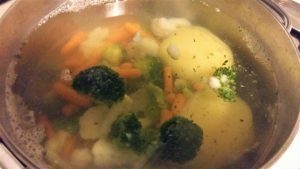 After this time, add also the mixed vegetables (I used broccoli, cauliflower, Brussel sprouts, and baby carrots) and boil for further 5 minutes. To boil for a while the vegetables before putting them in the oven will get them softer. Moreover, the cooking time in the oven will be reduced! In the meanwhile dice the onion. 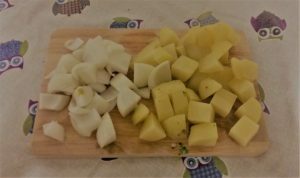 Then, drain the vegetables and chop the potatoes into bite size pieces. Do the same with the other vegetables, if needed. Put all the vegetables in a bowl and add generously Extravirgin Olive Oil, salt, paprika, Garlic Patè (at least 4 table spoons) and two third of the crumble bread. Stir everything together (I did that with my own hands!). Taste a piece and adjust the flavour, as you love better. 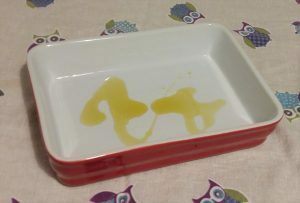 Grease an oven pan with olive oil. 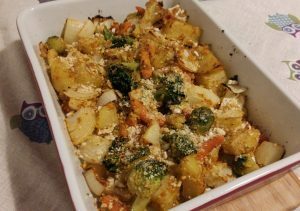 Put the mixed vegetables inside and coat them with the remaining crumble bread and drizzle a little bit of extra olive oil on the top of the casserole. Put in the oven for 25-30minutes at 200°C and…. already done! 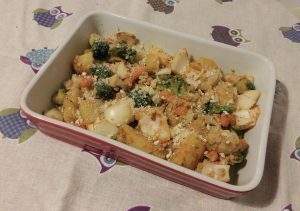 Enjoy this wonderful tasty and healthy side with your favourite Christmas main dish! Buon Appetito!